"Where do you see yourself five years from now"
"Where do you see yourself in 5 years time"
"what are your long and short term career plans"
"What are your career paths"
"what are your long-term goals"
"what are your short-term goals"
"what are your career plans"
The hiring manager has concerns about your stability and long-term plans. They want to know whether you actually have a career path or not? Now remember, hiring managers cannot predict the future and they don't expect you to either. What they really want to know is, are you worth the time and money it's going to take to hire you. It takes a lot of effort to hire an IT professional. Really, it's an investment. So while answering this question you have an opportunity to demonstrate your skills, interest in the job, aspirations and ambitions, and skills you would be keen to acquire while working with the organization. You need to be well prepared to answer this commonly asked question. Which IT skills you should focus on? 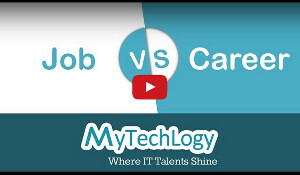 Which IT jobs you should target to achieve your career paths? What is the demand for your IT skill in the job market? Which companies are hiring for your skill-set? Is there a demand for your skill-set in your current location? 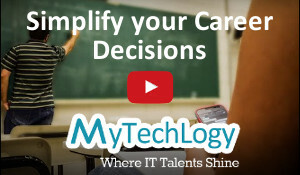 MyTechLogy, your online IT career development platform can help you answer all the questions. Plan & Accomplish your career paths! Create Your Career Path Now!